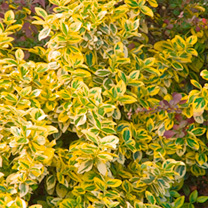 Euonymus fortunei 'Emerald 'n' Gold' is an RHS Award of Garden Merit winner and an all-round stalwart to the garden with its pretty oval-shaped leaves of green and golden yellow, tinged with pink in autumn. It is also known by it’s common name spindle 'Emerald 'n' Gold'. An evergreen plant, 'Emerald 'n' Gold' is low growing, so is useful as low maintenance ground cover. The colouring of Euonymus fortunei 'Emerald 'n' Gold' means it can complement a wide range of plants in the border, as well as being a backbone to the planting scheme. Supplied in a 2 litre pot.